bl.uk > Online Gallery Home	> Online exhibitions	> Asia, Pacific and Africa Collections	> Dapoorie Viaduct [Bombay]. 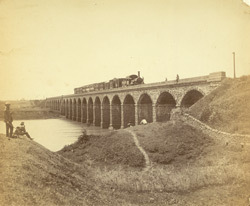 A photograph of the Dapoori viaduct, near Bombay from the 'Vibart Collection of Views in South India' taken by an unknown photographer about 1855. View looking along the railway bridge built in 1854 to link Bombay Island with the mainland of Thane. India’s vast railway network is an enduring legacy of the East India Company. In 1853 there were 32kms of tracks, whereas by 1948 there were nearly 50,000kms.